Finding the right ring that hits the spot at times can be hard and time consuming. Besides if you have a creative bug inside of you why not make the unique ring that you design yourself? Its not as overwhelming as you think, we make it easy:) If you have something in mind already we are eager to start making your dream a reality. Or if not yet and just looking for inspiration this collection of unique rings, that were produced for our clients by us, can give you just that. At Engagement Ring Express we are extremely passionate about custom unique ring creation and we specialize in that. 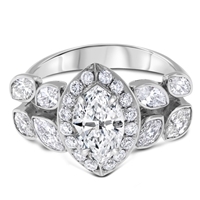 All of our handcrafted engagement rings are made from natural earth diamonds, using state of the art 3D technology. Every fraction of an inch of our rings features handmade designs details. Free shipping is included with every purchase, so as lifetime polish and service. Don't hesitate to contact us at any time. Please start a chat, message us directly at info@engagementringexpress.com or call 212-397-7377 and we will gladly answer all of your questions.